My dearest Harrylowe, gave me a present just for being me. (And frankly, I cannot think of a better reason to give ME a present.) 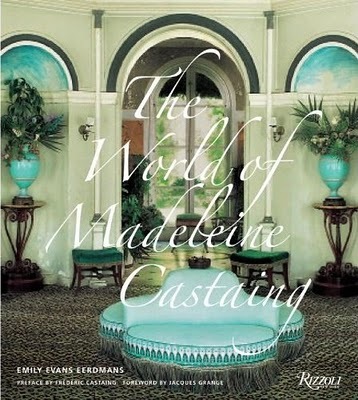 Anyway, my present was a copy of The World of Madeleine Castaing by Emily Evans Eerdmans. Well, it arrived today. I am so happy that I am leaving work, going home to brew a big pot of tea, and spending the afternoon wallowing in the book. Now, you will find tons of reviews out there so I am not even going to gum up the works with another (which would no doubt echo David Netto's sentiment: "The book is a masterpiece." But do read more: From the mouth of the author: Emily Evans Eerdmans. From little augury who links to her interview with Emily. From The Style Saloniste. Well, you can see why I begging off the review. Last night the lovely Miss EEE spoke in New York City. We are waiting with baited breath for her lecture in West Virginia. Till then, I am off to my couch! Thanks Harrylowe... and Emily. Being a huge fan of the work of Madeleine Castaing, I can hardly wait for this book! How exciting! A present well deserved!